Cross the International Date Line in flight and “lose” a day. Your flight continues to New Zealand. Welcome to Queenstown! Transfer to your hotel, then meet your fellow travelers at tonight’s welcome dinner. 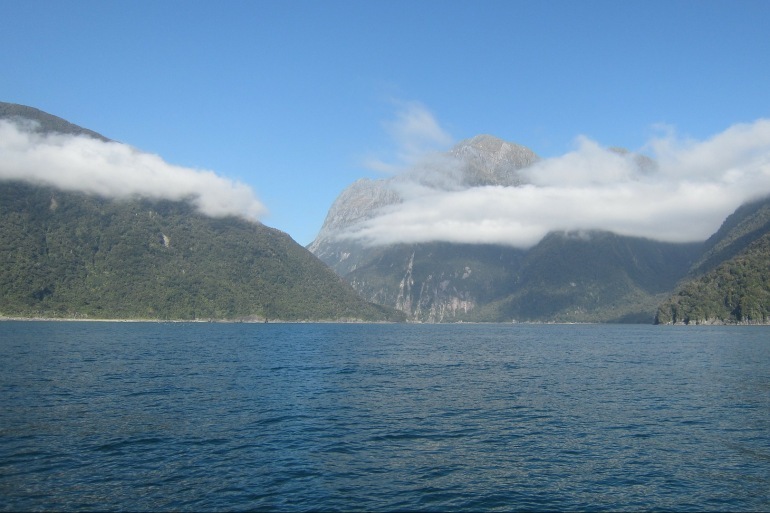 Head out to explore the breathtaking Milford Sound in New Zealand’s Fiordland, home to some of the most memorable scenery in the world. Enjoy a day at your leisure in Queenstown, or add an excursion. Enjoy a scenic drive through the island’s Southern Alps to Fox Glacier, stopping at Lake Hawea, Lake Wanaka, Knight’s Point and Thunder Creek Falls along the way. Enjoy a free morning at Fox Glacier or add an excursion. Then, transfer to Hokitika for the night. Leave Hokitika behind as you set out for Nelson, stopping at Punakaiki en route. Head out to explore Abel Tasman National Park and Kaiteriteri Beach, where you’ll embark on a scenic cruise. Tonight, dine with a Kiwi family at a traditional home-hosted dinner. On your way to Wellington, make stops in New Zealand’s wine country and the charming coastal town of Picton. Get to know Wellington, the southernmost capital city of any sovereign state, on a guided tour led by your Tour Director. Head to Rotorua, in the heart of the North Island’s Maori country. See the sights in Rotorua on a guided tour with your Tour Director, then pay a visit to a Kiwi Wildlife Park. Enjoy a free afternoon in Rotorua or add an excursion. En route to Auckland, stop at Waitomo Caves to try your hand at spelunking. Then, take a subterranean cruise to view the remarkable Glowworm Grotto on a guided tour. Later, explore Auckland with your Tour Director leading the way. Tonight, raise a toast to your trip at a farewell dinner with your group. Transfer to the airport for your flight home or extend your stay to explore Fiji. Conjure up your fantasy of paradise on earth: you’re probably imagining Fiji. Gorgeous palm-fringed beaches, crystal-clear lagoons, colorful coral reefs, lush tropical rainforests and majestic mountains—that’s what makes this island nation in the South Pacific one of the most enticing places on Earth. Paradise, aside, perhaps the true allure of Fiji lies with the warmth of the people and the fascinating blend of cultures that has endured for centuries. Situated on the shores of beautiful Lake Wakatipu, the Rydges Lakeland Resort Queenstown is only a 5 minute walk along the Lakefront to the center of town. The hotels 255 guest rooms are endowed with contemporary amenities to assure you immense pleasure throughout your stay. All the rooms offer spectacular views of the Lake Wakatipu. The Ben Lomond is a stylish and a casual restaurant that offers delicious contemporary New Zealand cuisine for breakfast and dinner. For your comfort and relaxation, the hotel offers a spa pool, heated outdoor swimming pool and a sauna. Conveniently located in Fox Glacier village (population 280), Heartland Hotel Fox Glacier is the perfect ‘base camp’ for discovering this spectacular area. Have fun exploring the great outdoors by day, then reflect on your adventures each evening as you enjoy our warm hospitality and cozy setting. The accommodation comprises two very different wings; from comfortable street frontage rooms to modern, luxury beachfront rooms. Full services including restaurant, bar and event facilities for weddings, conferences, meetings and parties are all available. Hokitika is centrally located, making it easy to travel to the main West Coast attractions such as the Punakaiki Pancake Rocks, Shantytown, Franz Josef Glacier and Fox Glacier, as well as numerous rainforest walks and gold mining history. Book your stay at Beachfront Hotel Hokitika and experience the best of the South’s Island’s West Coast. The award-winning Grand Mercure Nelson Monaco Resort, located in the sunny city of Nelson, is renowned for its relaxed atmosphere. All of its cottages, restaurant and facilities are arranged around a beautiful, village-style setting. Gorgeously landscaped around its own quiet stream and village green, it's the perfect place to disappear and relax. Enjoy stylish ambiance and sophisticated amenities – including two highly acclaimed restaurants and bars and a modern fitness room offering a variety of equipment. For corporate guests, high-speed Internet connectivity is available throughout the hotel, and our exclusive 26th floor Club Lounge affords the pinnacle of executive comfort with complimentary full buffet breakfasts, evening bar service and a business centre with spectacular harbor views. The new Rydges Wellington is centrally located downtown on Featherston Street, close to Custom Quay, Westpac Stadium, Victoria University and Wellington Railway Station. Rydges Wellington features fantastic harbor views and offers you 280 spacious accommodation rooms, all with kitchenettes, and leisure center including a lap pool, spa pool, sauna and exercise room. Valet parking is available. Dine in the retro-chic Plate Restaurant and Bar or order from the Take Inn Menu. Centrally located in the city beside mystical Lake Rotorua, this welcoming, international class Rotorua Hotel is just a brief stroll from the Rotorua Museum, Convention Centres and adjacent to Polynesian Spa. At Millennium Hotel Rotorua, you will find 227 air-conditioned rooms offering you a wide choice of accommodation styles, including the Club floor rooms with complimentary use of the exclusive Club Lounge. Set on the shores of beautiful Lake Rotorua, adjacent to the world famous Polynesian Spa complex and just a short stroll to all the attractions in Rotorua’s vibrant city center, The Sudima Hotel Lake Rotorua enjoys a location that is second-to-none. Its 248 guest rooms, many with superb views across Lake Rotorua, feature an ensuite bathroom, wireless broadband internet, Sky Television and much more. March ’10 sees the grand re-opening of the new Rydges Harbour View Auckland. Auckland’s newest and freshest hotel will set a new standard in style, and service. The hotel’s close proximity to the centre of the city makes it ideal for both business and leisure. The central city, SkyCity Casino, Sky Tower, Vector Arena and a variety of thriving bars, cafes and restaurants in Auckland’s Viaduct Harbour are just a short walk away. Freshly refurbished, our superior rooms are stylish, spacious sanctuaries. These rooms feature a spacious easy accessible bathroom. Sink into the luxurious new king bed with sumptuous triple sheeting and feather & down duvets or relax with the 32’ flat-screen LCD television and convenient mini bar.